Miller-Valentine Group Realty Services Dayton Regional Market Reports are comprehensive surveys designed to capture the current conditions and developing trends regarding commercial real estate space in the greater Dayton area. The properties assessed for these surveys are those deemed to most accurately reflect the region’s commercial real estate market. Please contact us for a complete version of these reports. A grand total of 24,857,675 square feet of retail space within the Dayton Regional Market was surveyed. Miller-Valentine Group Realty Services determined that 3,591,820 square feet, or 14.45% of the grand total, was reported to be vacant. Accordingly, those properties included in the 2017 survey demonstrate a very slight decline with a negative absorption within the regional market of (33,994) square feet. In the 2017 survey, we have sampled 317 Industrial Buildings which have been segmented into five (5) distinct markets identified as Dayton East, Dayton North, Dayton South, Dayton West, and the Upper Valley Market. A total of 26,244,718 square feet of industrial/warehouse space was surveyed within these five (5) markets, of which 2,998,821 square feet, or 11.43% was reported to be vacant. This vacancy rate is down from the 2016 figure of 12.22%. 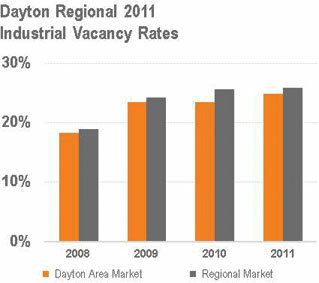 The surveyed projects within the Dayton Regional Market comprise a total of 42,685 units. Of the total market, 1,909 units, or 4.47%, were reported to be vacant. This year’s vacancy rate is slightly up from last year’s figure of 4.09%. In this survey, we sampled (341) Office Buildings which are segmented into four (4) distinct markets identified as Dayton: East, Dayton: North/West, Dayton: South, and Dayton: Central Business District (CBD). A total of 15,461,745 square feet of office space was surveyed within these four (4) markets, of which 3,781,416 square feet, or 24.46%, was reported to be vacant. A grand total of 25,153,488 square feet of retail space within the Dayton Regional Market was surveyed. Miller-Valentine Group Realty Services determined that 3,799,520 square feet, or 15.11% of the grand total, was reported to be vacant. Accordingly, those properties included in the 2016 survey demonstrate a positive absorption within the regional market of 67,116 square feet. In the 2016 survey, we have sampled 311 Industrial Buildings which have been segmented into five (5) distinct markets identified as Dayton East, Dayton North, Dayton South, Dayton West, and the Upper Valley Market. A total of 24,847,941 square feet of industrial/warehouse space was surveyed within these five (5) markets, of which 3,035,666 square feet, or 12.22% was reported to be vacant. This vacancy rate is down from the 2015 figure of 13.96%. 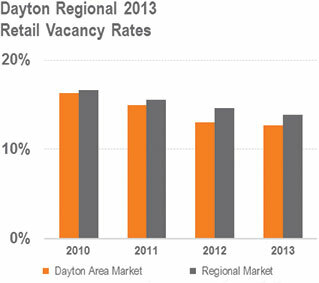 The surveyed projects within the Dayton Regional Market comprise a total of 41,214 units. Of the total market, 1,684 units, or 4.09%, were reported to be vacant. This year’s vacancy rate is down from last year’s figure of 5.05%. In this survey, Miller-Valentine Group Realty Services sampled (342) office buildings which are segmented into four (4) distinct markets identified as Dayton: East, Dayton: North/West, Dayton: South, and Dayton: Central Business District (CBD). A total of 15,451,195 square feet of office space was surveyed within these four (4) markets, of which 3,901,999 square feet, or 25.25%, was reported to be vacant. A grand total of 25,082,187 square feet of retail space within the Dayton Regional Market was surveyed. Miller-Valentine Group Realty Services determined that 3,912,359 square feet, or 15.60% of the grand total, was reported to be vacant. Accordingly, those properties included in the 2015 survey demonstrate a negative absorption within the regional market of (66,429) square feet. In the 2015 survey, we have sampled 302 Industrial Buildings which have been segmented into five (5) distinct markets identified as Dayton East, Dayton North, Dayton South, Dayton West, and the Upper Valley Market. A total of 24,019,309 square feet of industrial/warehouse space was surveyed within these five (5) markets, of which 3,352,107 square feet, or 13.96% was reported to be vacant. This vacancy rate is down from the 2014 figure of 19.39%. 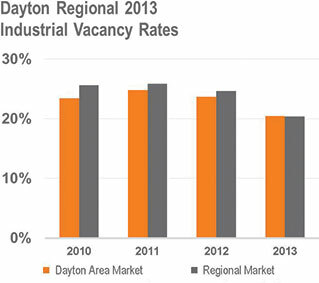 The surveyed projects within the Dayton Regional Market comprise a total of 42,033 units. Of the total market, 2,123 units, or 5.05%, were reported to be vacant. This year’s vacancy rate is down from last year’s figure of 6.35%. 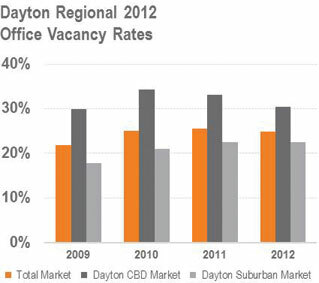 In this survey, we have sampled (341) Office Buildings which have been segmented into four (4) distinct markets identified as Dayton: East, Dayton: North/West, Dayton: South, and Dayton: Central Business District (CBD). A total of 15,385,960 square feet of office space was surveyed within these four (4) markets, of which 4,004,941 square feet, or 26.03%, was reported to be vacant. Miller-Valentine Group Realty Services surveyed 193 retail properties in the Dayton Area Market. This market is divided into sub-markets of East, North, South, and West. A total of 17,090,485 square feet of retail space was surveyed within these sub-markets. This review found that 2,346,497 square feet, or 13.73% of the total, was reported to be vacant. That result represents an increase in the vacancy from 2013, when a 12.69% retail vacancy rate was reported. In the 2014 survey, we have sampled 301 Industrial Buildings which have been segmented into five (5) distinct markets identified as Dayton East, Dayton North, Dayton South, Dayton West, and the Upper Valley Market. A total of 22,227,025 square feet of industrial/warehouse space was surveyed within these five (5) markets, of which 4,310,659 square feet, or 19.39% was reported to be vacant. 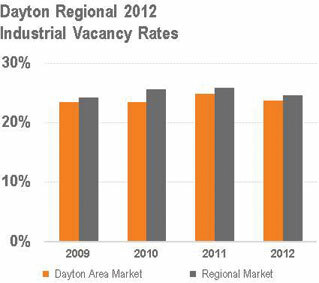 The surveyed projects within the Dayton Regional Market comprise a total of 42,927 units. Of the total market, 2,728 units, or 6.35%, were reported to be vacant. This year’s vacancy rate is down from last year’s figure of 8.10%. In this survey, we have sampled (343) Office Buildings which have been segmented into four (4) distinct markets identified as Dayton: East, Dayton: North/West, Dayton: South, and Dayton: Central Business District (CBD). A total of 15,423,546 square feet of office space was surveyed within these four (4) markets, of which 3,958,079 square feet, or 25.66%, was reported to be vacant. 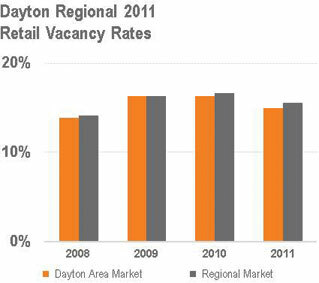 A grand total of 24,966,709 square feet of retail space within the Dayton Regional Market was surveyed. Miller-Valentine Group Realty Services determined that 3,457,672 square feet, or 13.85% of the grand total, was reported to be vacant. Accordingly, those properties included in the 2013 survey demonstrate a positive absorption within the regional market of 165,808 square feet. In the 2013 survey, we have sampled 297 Industrial Buildings which have been segmented into five (5) distinct markets identified as Dayton East, Dayton North, Dayton South, Dayton West, and the Upper Valley Market. A total of 21,805,220 square feet of industrial/warehouse space was surveyed within these five (5) markets, of which 4,444,540 square feet, or 20.38% was reported to be vacant. 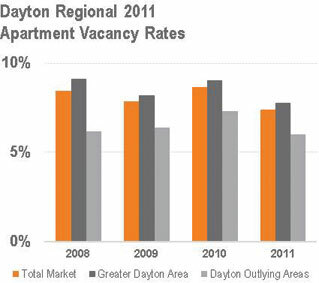 This vacancy rate is down from the 2012 figure of 24.61%. 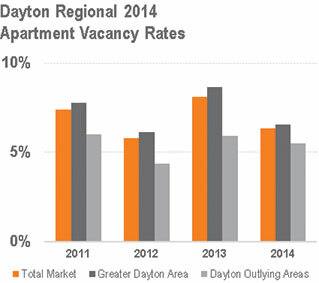 The surveyed projects within the Greater Dayton Market Area comprise a total of 33,526 units. Of the total market, 2,900 units, or 8.65%, were reported to be vacant. This year’s vacancy rate is up from last year’s figure of 6.15%. The surveyed projects within the Dayton Regional Market comprise a total of 41,321 units. Of the total market, 2,389 units, or 5.78%, were reported to be vacant. This year’s vacancy rate is down from last year’s figure of 7.38%. 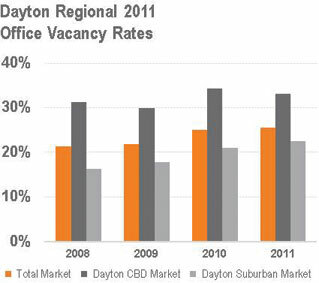 In this survey, we have sampled (346) Office Buildings which have been segmented into four (4) distinct markets identified as Dayton: East, Dayton: North/West, Dayton: South, and Dayton: Central Business District (CBD). A total of 15,753,495 square feet of office space was surveyed within these four (4) markets, of which 3,916,174 square feet, or 24.86%, was reported to be vacant. In the 2012 survey, we have sampled 297 Industrial Buildings which have been segmented into five (5) distinct markets identified as Dayton East, Dayton North, Dayton South, Dayton West, and the Upper Valley Market. A total of 20,213,642 square feet of industrial/warehouse space was surveyed within these five (5) markets, of which 4,978,630 square feet, or 24.63% was reported to be vacant. 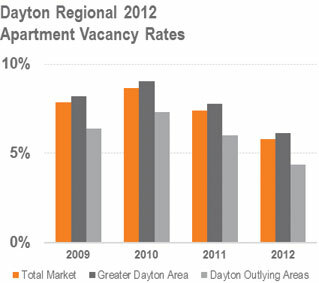 This vacancy rate is down from the 2011 figure of 25.85%. A grand total of 25,168,245 square feet of retail space within the Dayton Regional Market was surveyed. Miller-Valentine Group Realty Services determined that 3,673,303 square feet, or 14.59% of the grand total, was reported to be vacant. Accordingly, those properties included in the 2012 survey demonstrate a positive absorption within the regional market of 272,393 square feet. 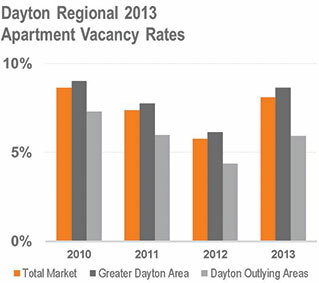 We sampled 352 apartment projects containing 42,562 units in the Dayton Region, which have been segmented into the markets identified as Dayton Central Business District (CBD), East Dayton, North/West Dayton, and South Dayton Market Areas. In addition, the Dayton Outlying Market Areas includes the following five sub-markets of Upper Valley, Middletown, Franklin-Springboro, Springfield, and Xenia Market Areas. Of the total market, 3,143 units, or 7.38%, were reported to be vacant. We sampled 267 retail facilities for this survey. These properties are divided into nine distinct sub-markets identified as: Dayton East; Dayton North; Dayton South; Dayton West; Springfield; Upper Valley; Xenia; Franklin-Springboro; Lebanon-Middletown. 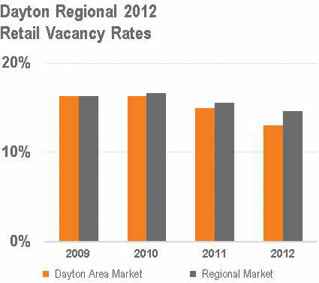 A grand total of 25,943,386 square feet of retail space within the Dayton Regional Market was surveyed. We determined that 4,042,711 square feet, or 15.58% of the grand total, was reported to be vacant. In the 2011 survey, we have sampled 293 Industrial Buildings which have been segmented into five (5) distinct markets identified as Dayton East, Dayton North, Dayton South, Dayton West, and the Upper Valley Market. A total of 19,514,164 square feet of industrial/warehouse space was surveyed within these five (5) markets, of which 5,043,726 square feet, or 25.85% was reported to be vacant. 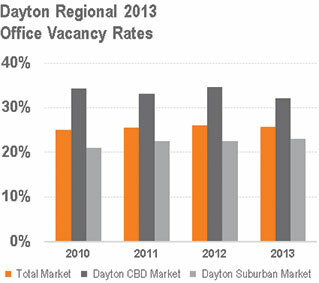 In this survey, we have sampled (344) Office Buildings which have been segmented into four (4) distinct markets identified as Dayton: East, Dayton: North/West, Dayton: South, and Dayton: Central Business District (CBD). A total of 15,374,741 square feet of office space was surveyed within these four (4) markets, of which 3,929,839 square feet, or 25.56%, was reported to be vacant.